This is a question that comes up occassionally. Yes. Really. 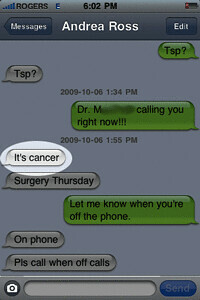 Andrea really SMS’d me to let me know the biopsy results when she received them on October 6. You can see it for yourself in the image of this post. SMS is just one of the many ways Andrea and I stay connected. On October 6th, it allowed Andrea to keep me up to date in real time as she spoke with her physician. The sequence happened like this. I was working in my home office when the phone rang. It was Andrea’s physician. We had been anxiously awaiting the results since the biopsy on September 29. Of course, the doctor wouldn’t tell me the results over the phone. So, I gave her Andrea’s cell number. It took a few minutes for Dr. M to make the call. It was 1:55 p.m. when I received the message “It’s cancer”.